Balls, bells and lanterns. – Dirty wet dog , boats and sailing. Ok so ‘balls, bells and whistles‘ might have been better but it’s free here so you get what you get ok !. Balls in this case refer to anchor-balls, bells to kettlebells and lanterns are simply lanterns although in this instance ones that are used as anchor lanterns. Don’r worry, it will all start to make sense especially when i add riding sails, chums, angels, clapper plates and flopper-stoppers. You see it’s all to do with anchoring if only the peripheral bits that get missed so often. Firstly then : signals. I really like to see balls and lanterns hoisted when they should be and the gaffer in the lead photo seemed top be getting it just right. I don’t think the owner was aboard but his anchor ball was hanging in the fore-part of the rig and round about dusk his anchor lantern came on too. I think he must have an automatic system as it went off shortly after dawn just as i was taking mine down for the passage across the Thames. According to my recent reading of Colregs i just slip into the category above where i wouldn’t officially be required to hoist a day-shape, in this case an anchor ball, except that i am often near a channel, often not in an established anchorage etc…that size limit being 7 metres. All that Colregs say about the anchor ball is that it should be ‘forward where visible’. By convention i hoist mine about a third of the way up the mast and above about the centre of the foredeck except aboard the Liberty where it ends up a bit further forward. For lights i notice that most sailors combine a masthead tricolour light with an all-round white light which is used as the anchor light. One boat i saw recently was using his motoring light halfway up the rig as an anchor light ! I find it hard to explain why but i have always preferred a lower hoisted lantern at about the same height as i carry the anchor ball, in fact my usual set-up is to combine the anchor ball with an all round LED lantern that can run off the main battery. The version i have aboard WABI”’ is a ‘Davis’ light and has been made conveniently with a lighter plug jack and i have the plug on my main switchboard. There is i believe an automatic version intended for use as an anchor light. Right now Inanda has no electrics to speak of so i have been using my old system which is a 12v camping lantern with an LED bulb and 4 big ‘D’ cell battery’s which will do about 100 hours. I have never owned a bell aboard a boat although i understand that it is a US coastguard requirement for US vessels anchored in poor visibility and should be rung for 5 seconds every minute….just imagine being on ‘bell’ watch on a US registered yacht with an AR owner…….ding ding dingaling ding every minute ! Bells : in this case i am actually talking about kettlebells and if you don’t know what one of those is then pop down to your local muscle gym and ask……hint…..they are a cannonball-like weight for training with. I happen to have a couple of bells because they are useful for some exercises and became incredibly popular for a while, even to the extent of gyms running briefly popular kettlebell classes. They also happen to make quite useful mud-weights for when conventional anchors aren’t allowed and make even more useful rode-tamers to help slow the boat that tends to wander around at anchor. My use of a kettlebell lowered down the anchor rode we used to know as an anchor-chum or anchor-angel although another name is an anchor ‘kellet’. A weight shackled to and lowered down the rode will increase the catenary curve, reducing the angle of pull at the seabed and have a useful secondary effect of reducing the swinging circle or the amount of sheering at anchor. I carried a kettlebell aboard WABI”’ because she could be so bad mannered in a windy anchorage. One of my favourite spots to anchor for a while is just off the beach inside the river Yealm bar. There isn’t a huge amount of space there and usually too many boats will try to crowd into the available space. One time i was there i had a great spot but the Liberty was sheering-off each way which wasn’t a problem until 2 other boats anchored within my swinging space. Even though i was clearly there first and maybe should have asked them (politely) to bugger-off the sheering problem was actually mine own so i tamed it quite a bit with the bell lowered down the rode. On later visits i tended to use the reefed mizzen as a riding sail and that is far more effective for keeping the Liberty head to wind. As a side note the Hunter Liberty design is well known for not settling at anchor but for sheering all over the anchorage, i know of one that dragged its (inadequate) anchor that way. That also leads me on to express an opinion that maybe small boats actually need larger anchors than the makers normally claim. At anchor in the Yealm…posh visitor. In the past anchor-angels or anchor-chums did get talked about in the cruising sailing literature and they did seem to be one solution to the problem of under powered anchors. My first use of them aboard the Frances was a mistake in that i should have done something simpler first and that was to increase the amount of chain in the rode. After doing that my Frances 26 became a much better behaved boat at anchor and i never had to use the kettlebell in that setting again. The Liberty didn’t settle down at anchor significantly with added chain and the KB did help to some extent but what was far better was to stop the sheering by keeping the boat head to wind with added resistance aft. That was a simple option with the ketch rigged liberty as the mizzen with one reef and sheeted in hard does the trick. I think that my anchoring has gone through 3 stages : stage 1 was when the only time we anchored was a vain attempt to stop a race boat from drifting backwards on the tide, the second stage was when i actually anchored properly for the first time and the boat was still where i left it after a couple of tides had run past, the current stage is where i know a little about anchors and anchoring and have tried to develop effective anchoring techniques on my boats. From hardly ever anchoring i have gone to the far opposite end and spend long periods at anchor. The next things that i have then had to deal with involve making the boat comfortable at anchor and one of those things is having to deal with a boat that wants to go ‘rock-n-roll’ at anchor. To begin to explain that problem i am going to talk about my first attempt to run and restore a small classic boat….in fact the same type of boat as Inanda but one in much worse condition. For a few years i dropped out of sailing and boat ownership completely while i got on with other things, my job consumed a huge amount of my time and energy and my outdoors interest was largely in bushcraft and it’s related craft….the canoe and the sea-kayak. It was also the period when i saved hard for the day when i could have an expensive and niche boat like the Frances. Just before that period of being away from sailing i bought a cheap and very run down Deben with the plan of completely restoring it and cruising it. That boat i picked up in one of the Chichester marinas and sailed it back to Plymouth with virtually no gear and only one really functional sail. The boat was so bad that it became a fun trip just to get it and myself back to Plymouth in one piece. This isn’t the actual boat , this is a Deben with the deck-edge variant and looks to be in similar but better condition than the one i had. I did almost bid on this one when it came up on ebay but as with the one i had the cost of restoring and refitting this one would have been far beyond any end value of the finished boat. The costs with my one would have had to include a new engine, complete new rig and sails and a significant amount of work. Inanda seems to have a good working engine (most of the time) a strong rig and good sails. Right now what she needs is the remedial woodwork to bring her back up to her best. However that’s not the story here, the actual story for this last section of the post is that boat’s behaviour at anchor. During the trip back from Chichester i anchored several times, i definitely anchored twice in the Solent, once in Poole and then once again just near Weymouth. After the long beat across Lyme bay i anchored in Dartmouth and then once again in Plymouth sound just before heading into Huggins yard and a free mud-berth. In short that boat was a vicious roller at anchor. Every anchorage that i used except for just inside Hurst castle was really uncomfortable because the boat would go into a sickening cyclical roll at the first opportunity. I can’t remember the number of times that roll threw the kettle off the simple camping stove that i had or the number of times she threw me across the cabin. The low point came early one morning when she got into a worsening cyclical roll and threw me out of my bunk. I don’t know why she was so bad in the same conditions where Inanda sits reasonably steadily at anchor. 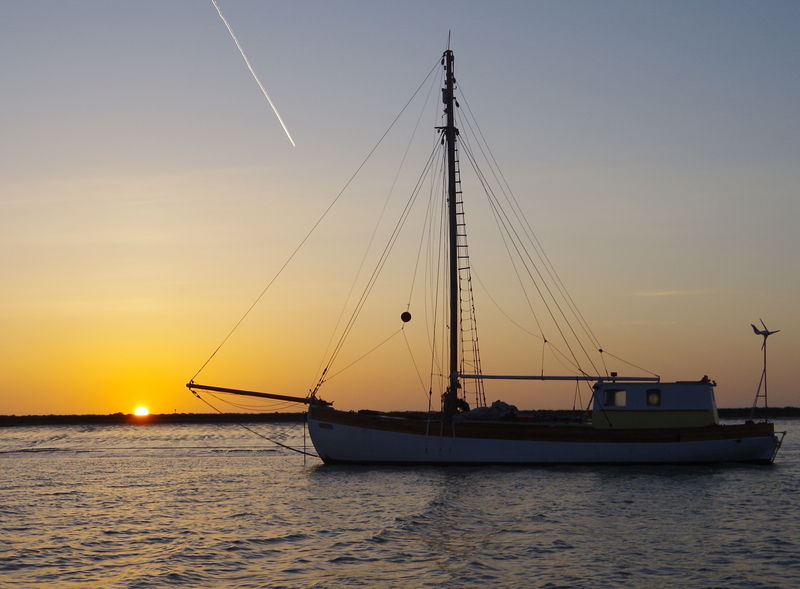 During my recent trip back from Ipswich i did anchor in places where a swell was getting into the anchorage, behind Dungeness for example and she would do a few rolls and then stop. It might be that Inanda is better ballasted and/or that the heavier but shorter rig dampens the roll…..i just don’t know. What i can say is that it made me dislike that boat intensely and regret buying her. When i bought my dream boat i was advised that she could also be a bit of a ‘roller’ in some situations, mainly when she could be laying beam-on to a swell. I didn’t meet that problem at first in the Uk but it did happen when i was cruising in south Brittanny and in fact it happened in 2 anchorages. The first, in the outer harbour at Audierne i put up with but the second time in Morgat i dealt with it because i had to be there for several days. The situation there was probably that of the Atlantic swell coming around the headland to the south and ‘running-out’ in the shallow water where i was anchored. The roll was cyclical and uncomfortable and i didn’t want to move into the marina so i made a device called a ‘flopper’stopper’ from a spare bucket, some pieces of scrap ply and some heavy shackles for weight. Here is the basic idea rigged both sides of another boat at anchor. The part that does the work and that you can’t see is in the water and essentially it is a water-brake. The idea is that the ‘brake’ which can be one of many different forms is pulled down by it’s attached weight as the boat rolls that way…..then as the boat tries to roll back the brake has to pull through the water-column. The force applied as the plate, bucket or crate pulls through the water sets up a resistance against the roll and slows the cyclical roll to tolerable levels. Mine i rigged from my spinnaker pole and a masthead halyard so that the force would be transmitted down through the boat’s excellent chainplates. As with all things i could have made a better version but what i did quickly bodge together worked well enough. In the next post in this series i will hopefully get around to summarising what i have worked out about anchors and anchoring. My plan is also to cover my favourite standby technique for rivers and tight anchorages with opposite-going flows….the Bahamian moor. Previous Big fat ice cream time.